Compare prices on car hire in Macerata from all the major brands and find the best deals. When you book through us, unlimited mileage and insurance are always included in the price given. Macerata is the capital of the province of Macerata and is part of the Marche region. The region is located in Italy’s southern part, bordering the Adriatic Sea in the east.Macerata is about. 20 km inland and the regional capital, Ancona is the tip of the coast, approx. 50 km northeast of Macerata. The city was built on the ruins of the Roman city Helvie Recina of 900 – and 1000’s, and today is home to just over 40 000 inhabitants in Macerata (2009). 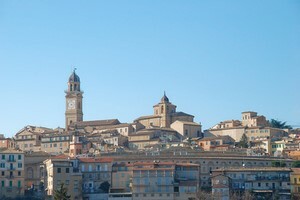 The old town of Macerata is located atop a small hill surrounded by an old city wall. The center here is the Piazza della Libertà where you can find historical palaces such as the Loggia dei Mercanti from the Renaissance. On the Piazza Vittorio Veneto is an art gallery and a museum housed in the Palazzo Ricci. Every summer, held Sferisterio Opera Festival in the major opera venue that is outdoors and can accommodate 3000 seats and 6000 standing. Anacona Airport is an international airport located about 50 km south of Macerata.